Hair is a substance formed of a protein called keratin. There are hair follicles in our scalp and body skin (except palms and soles) which produce hair cells. The hair grows because the old hair cells are pushed out by the frequently forming new hair cells. So the hair is formed by a line of dead keratin cells. Usually, a healthy human scalp has about 100,000 to 150,000 hairs. The average growth of hair is about ½ an inch a month. 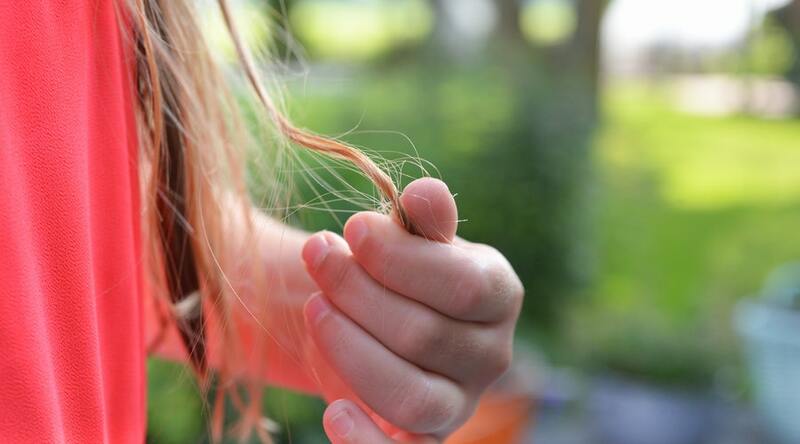 Every strand of hair has a life cycle and eventually falls out. It is normal to lose about 100 hairs a day. But lost hair is usually replaced by new hair. Abnormal Hair loss is also called “Alopecia”. Hair loss can be divided into many types. It is a hereditary condition which is passed from generation to generation through genes. It affects men more than women. When it occurs in males, it is called “Male pattern hair loss”. When it occurs in females it is called “Female pattern hair loss”. The men suffering from androgenic alopecia start losing their hair in their teens or around 20 years of age. The hairline will be receding. Hair will start disappearing from the front of the scalp (2 temples) and crown of the head (vertex). Mainly genetics and the male hormone testosterone play a role in Male pattern baldness. Male pattern hair loss can be divided into 7 stages, according to the Norwood scale. 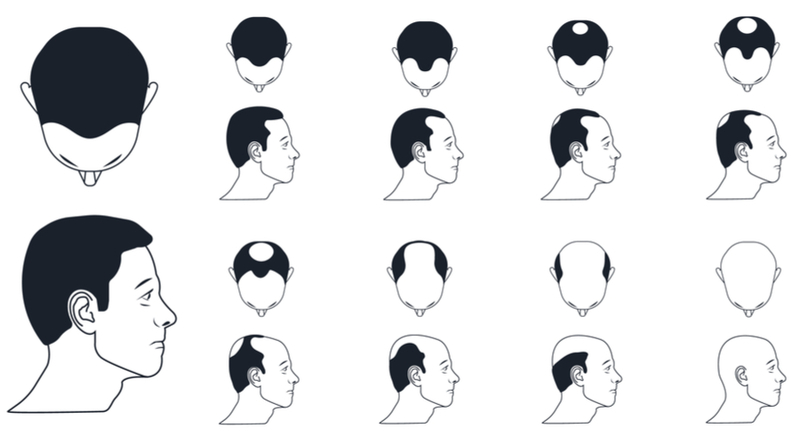 The stages represent the pattern and severity of balding. Stage 1 – Hair loss is not significant. The recession of hairline is not visibly noted. Stage 2 – The hairline around the 2 temples of forehead become slightly recessed. This represents a mature hairline. Stage 3 – Hair loss is clinically significant in this stage. The recession of hairline is significantly deep in the temples. The temples will look like M / V or U pattern. The area of recession can be having a few thin hair strands or completely a bald patch. Stage 4 – Hair is scanty or completely bald over the vertex. Hairline recession over the temples is significant. There is a band of the scalp with normal hair in between the areas of balding. Stage 5 – The balding is more prominent at the temples and crown. The band which separated the 2 regions is still there, but it has become narrow when compared to stage 4. The hair in the band is scantier. Stage 6 – The band separating the 2 areas of hair loss is sparse and scanty. So the 2 areas of balding that are crown and temples are joined. Stage 7 – This is the most severe stage. There is a band of hair in the scalp which has sparse hair which goes around the sides of the scalp. Women with Androgenic Alopecia do not show prominent areas of balding, but entire scalp will lose hair. Usually the thinning of hair becomes apparent after 40 years of age. It worsens after menopause. When looked closely, the crown of the head and the line of parting show majority of thinning. As it is commonly experienced the hair loss increases with age. As hair follicles slow down, new hair will grow slowly. Losing of hair continues making the hair gradually to thin out. It is a natural process of life. Not only scalp but all the hair in the body is lost. The eyebrows, eyelashes, hair in underarms and genital region also fall out. The lost hair will be apparent in patches over the scalp. Usually, it is sudden onset. It is thought to be an autoimmune condition where antibodies are formed against your own hair follicles causing damage. This condition is more common in children and youth than adults. Sometimes the scalp loses all the hair. When it is so the name changes to “Alopecia totalis”. Usually, there is no cure for this condition. However, some affected individuals will recover spontaneously. The hair grows back again within a few months. It happens due to a psychological condition. Children suffer commonly than adults. They pull their own hair out. The re-growth of hair will be seen in different lengths and usually, the broken hairs will be commonly visible in places which are accessible to pull out. These children need psychological assessment and counseling and maybe the psychiatric referral. This is a permanent hair loss which happens due to various inflammatory types of skin diseases such as Lupus. When you are suffering from stress and poor sleep, hair loss will be noticeably visible. Use a medicated shampoo or lotion containing any of the following substances such as Selenium sulfide, ketoconazole, Zinc pyrithione or tea tree oil. These are available as OTC products. Read the instruction leaflet carefully and comply with the instructions regarding the frequency of application. May need to use for long periods to achieve control and keep scalp free from dandruff. If the shampoo does not work or if the scalp becomes irritated and red, seek help from a doctor. There are conditions like seborrheic dermatitis which mimic dandruff. When should you start treatment for hair loss? There is no such time at which stage you should start treatment. The products used for hair loss come in lotions, topical ointments and foams. This medication thickens the hair strands because it enlarges the hair follicles. It also increases the number of hair and the period of hair growth. It is safe and effective. Minoxidil can be used in both men and women. This should be used for at least 2 -3 months to see a result. It may not work for all individuals. Try for about 3 months before stopping as it takes time for the desired action. If it responds you have to continue to use it as long as you want the hair. However, if stopped, the action will be reversed and you will notice that you will lose hair again. Apply Minoxidil 2% solution directly into dry scalp and massage in with your fingers to stimulate hair growth. Use it twice a day. If you develop irritation, itching or redness stop using it and seek help from a doctor. This is used only in male pattern baldness, especially when hair loss is around the vertex. It reduces the DHT (Dihydrotestosterone) Hormone which is the androgen giving a man his male characteristics. However, this also contributes to male pattern hair loss. DHT thins the hair follicles in the scalp mainly around the crown. As Finasteride reduces the level of DHT hormone in the body, hair loss is reduced, while growth of scalp hair increases. Do not use this in women and in children. Medications will not be helpful to all. Seek help from a dermatologist to find the most suitable product for you. Learning to cope with it – Come into terms with hair loss. Especially Involutional hair loss occurs due to aging and you cannot reverse it. These tips will help you to reduce the frequency of losing hair. Eat a healthy balanced diet rich with vitamins, minerals, proteins etc. Avoid tight hairstyles, frequent styling using strong chemicals, hair colors etc. If hair loss is affecting your self-esteem and lead you to depression additional help will be needed from a psychologist or psychiatrist. These methods should be attempted by a qualified professional or a specialist. In this method, the hair follicles which are at the back of your head which is resistant to DHT are removed and placed in the areas of balding such a temple and crown. Platelet-rich plasma is separated from your own blood and injected to your scalp where hair is scanty. It is quite a painful procedure even after applying a local anesthetic. These injections are given in a frequency within a preplanned time period. It is effective in younger people with hair loss. However, research is still underway.